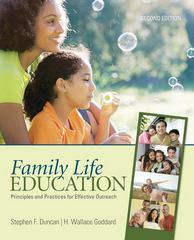 Family Life Education 2 Edition Drawing on the best scholarship and their own years of professional experience, the authors of this thoroughly updated edition begin by discussing the foundations of family life education and encourage readers to develop their own outreach philosophies. The book then helps readers learn principles and methods for reaching out to the public and how to form and use community collaborations and use principles of social marketing to promote programs. The Second Edition contains five new chapters on education for personal well-being, marriage and relationship education, parenting education, sexuality education, and narratives of family life educators. The authors' practical, hands-on experience is used to demonstrate how readers can put principles from the latest and best scholarship into action and reinforced with the Interactive Explorations sections throughout.